If you have stayed with us, please feel free to leave a comment with your review of our place. If you are planning your trip, here is what people say about us. My stay at Pauline’s place was amazing! The room was great, the location is absolutely fantastic and the views and sunsets breathtaking. On top of this, Pauline is an amazing host! She baked me the most delicious French bread and showed me around in the village close to her house! 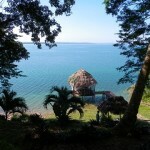 I would recommend Pauline and her home to anyone visiting the Flores/Tikal area! loved the room. loved the view they arranged for a driver to pick us up they arranged for us to eat meals there if we wanted Rachel was the personal house lady and she went above and beyond for us. 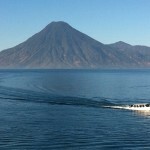 They arranged personal drivers for us as well to take us to the locations we wanted to go. I would highly recommend this location if you are looking for a relaxing place to spend a relaxing time. Our trip at Pauline’s house was wonderful. Perfect location around the lake, where you can have both sunset and sunrise. Unforgettably beautiful. Pauline is very helpful and is also a remarkable cooker. I strongly recommend you to take the diner extra. For French people : Pauline bakes her own bread French style, delightful. The only issue is that it’s a bit far from the shuttle deserved cities around the lake, and the road is actually a bit bad… No big deal if you double check with Pauline how to get there. In the north of Flores we met two perfect hosts, Pauline and Victor! It started when our car could not get us through to their place because the road was washed away after heavy rain. Pauline came along to pick us up and get us personally with her Jeep. Next to that the two where social at any time and making an effort prepared great meals for breakfast and dinner. 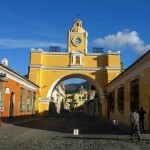 They also provided us with travel advise since this was our first trip to Guatemala. Next to that the place is amazing! 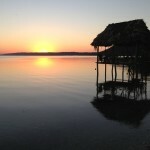 The house is right at the shore of Laguna de Peten and has its own pier with a little pavillion over the water. There is no better place to relax than in a hammock surounded by the lake! Pauline managed to offer the big room to us which was well appreciated since its build is almost a peace of art. The pictures on Airbnb do NOT promise too much. It is beautiful. We wish the two of them all the best for their future plans! Thank you so much for sharing this beautiful peace of earth with us! Tempted? Check out our property and room rates.